A couple of months ago, a friend let me try his Bose QuietComfort 35 noise-cancelling headphones in a coffee shop. They were playing some fast-paced music with a pronounced thumping bass through the store’s sound system. To my astonishment, with the QC35 on, the annoying bass almost completely disappeared. It was as if someone had removed the sub-woofer from the sound system. I was pleasantly surprised. Low-frequency noise annoys me and stresses me out, so over the years I have looked at many options to remove rumbling machines, humming air conditioners, traffic noise, and sudden impulse noise from my environment. I have also done a few experiments that showed me how greatly a noise-free environment can improve cognitive performance. So you can imagine these Bose headphones got my attention. I previously owned a pair of noise-cancelling earbuds, but while they sounded good, they only attenuated constant low-pitched noise, and only a bit. They didn’t really help with everyday noise, so I didn’t think much of “noise-cancelling.” The earbuds ended up in the drawer, and having been rejected, they pretty soon stopped working. Short of removing myself from the noisy environment, the only effective solution I knew of were industrial earmuffs. I tested the QuietComfort 35 more thoroughly in a Bose shop. I had the store play some bass-heavy music through their audio system, and again the cans removed the lower-pitched parts of the music. The staff even let me walk out onto a busy street, so I could test the headphones against road traffic. They “switched off” the rumble. They also sounded great, so I decided I really wanted to have them in my arsenal – and bought them. What are the QC35 good for? I listen to a large variety of music: rock, pop, new age, acoustic guitar, classical, and occasionally techno. I have found the Bose QC35 very pleasant for long-time listening. The bass is meaty, and the highs are detailed without sounding harsh. The mids could be a bit more pronounced, but overall these headphones sound really good. Because they cancel the background noise so well, I hear a lot more details even in noisy environments, and I can listen to music at a much lower volume. They can be used in wireless (Bluetooth) and wired mode. I live close to a busy road, and these headphones almost completely eliminate the rumble of trucks, buses, air-conditioners, and generators. What remains is the occasional honking and, funny enough, the chirping of birds. I used to listen to music or podcasts through earbuds while riding the subway or sitting on a plane. I often had to crank up the volume almost to the max to get pleasure out of my music and clearly understand an audiobook or podcast. Even then, the squealing and screeching of subway trains when they enter a curve can be ear-deafening. Now I put on my Bose and can actually listen to my music or an audiobook at living-room volume. People around me annoy me much less. I am in a “bubble.” I can see the people around me and watch them talking on their phones, but it feels like I am watching TV with the sound muted. Having been designed to remove airplane and turbine noise, the QC35 are a great flight companion. They remove most of the noise and with it the fatigue that comes from having to sit on an airplane for hours on end. I use the included airplane adapter and cable to plug them into the entertainment system. Watching a movie becomes a real pleasure. I have never run out of battery, even on long-haul flights. Removing the Bose after an hour or two, the city noise comes back rolling in, and I know exactly why I bought them. To me the noise-cancelling feels natural. It removes a lot of what we weren’t hearing a couple of hundred years ago anyway. I combine them with myNoise (iOS) or Tmsofts’s White Noise (Android) and listen to white noise, sounds from space, water streams, and natural soundscapes (ocean waves, animal and forest sounds and so on). Sudden sounds startle me and take me right out of my nap. The headphones shield me from this and allow me to just drift away. The QC35 attenuate voices and other higher-pitched sounds, but voices do come through. I mask them with white noise. If you sleep on your back, the Bose, in combination with white noise and earplugs, can be very effective for snore blocking. Earplugs and earbuds alone don’t attenuate enough of the lower frequencies if the snoring is really loud. Sound also gets to your eardrums via the tissue around the ear, which earplugs don’t cover. These headphones actively cancel low-pitched noise. Combine the QC35 with moderate-level white noise to mask the remainder of the higher-pitched parts of the snoring. If your bed partner or roommate snores like a chainsaw, wear earplugs underneath and play white noise. The Bose QC35 block lower-pitched sounds very well; while listening to music, you will most likely feel like in a sound cocoon and hear nothing else. 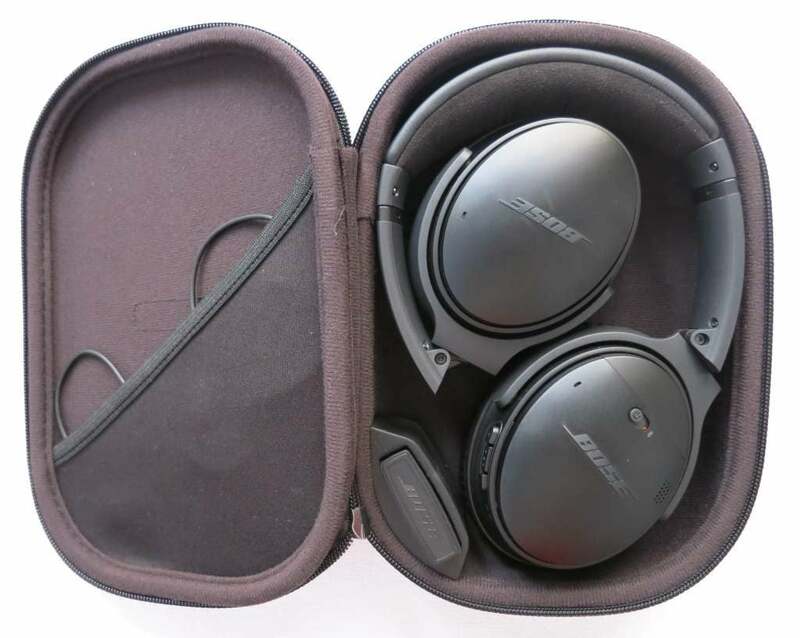 If you use them purely for noise-cancelling (without music), voices and higher-pitched sounds do come through. They get attenuated, but not nearly as well as with high-quality earplugs. This seems to be due to the physics of active noise-cancelling. So contrary to what some people claim, you won’t get a mobile sound-proof room with these. On the other hand, with low-pitched noise, my favorite earplugs with a noise reduction rating (NRR) of 33 (that is about as good as you can get) don’t stand a chance against the QC35. Intruding speech can quite negatively affect cognitive performance while reading and writing: When I feel bothered by the chatter of people around me and don’t want to listen to music, I mask the “voices” with white noise. Generally, this works well, provided the people around me aren’t excessively loud. There is a little trick to get closer to silence: Wear earplugs underneath the Bose. That way you optimally combine the strengths of over-the-ear active noise cancelling and passive sound isolation. If that doesn’t do it, add white noise, but don’t walk around town. The QC35 are very comfortable; I can wear them for long hours. They weigh 240 grams (8.3 oz). They are controlled via 3 easy accessible buttons: You can change the volume, start/stop tracks, skip tracks, take/decline/end phone calls, and initiate voice commands. Connect to two Bluetooth devices at the same time: If you get a call on your phone while listening to music via your iPad/PC, the music pauses, a female voice announces the name of the caller and you can take the call using the built-in microphone. After the call, the music continues. Alternatively, you can also connect to two phones and take a call from either one. Can also be used in wired mode. An audio cable with a standard 3.5 mm plug and an airline adapter are included. Bose states the battery life in wireless mode (noise-cancelling always on) is 20 hours. I am getting pretty close to that. In wired mode (noise-cancelling on) the battery life is specified as up to 40 hours before you need to recharge. I have not tried to completely drain them in wired mode. Depending on my needs, I alternate between wired and wireless and get about 30 hours in mixed mode. The built-in battery is rechargeable via a standard USB charger (e.g., your phone’s) or a computer. A complete recharge takes about 2.5 hours. A very short USB cable is include, but no charger. I don’t mind that there is no charger, but the cable is so short, it is a joke. I use my phone’s USB charger and cable instead. You can still listen to music in wired mode if the battery dies. No battery means no noise-cancelling though. Do you live in a noisy city (like me) and want peace and quiet from the rumbling, humming, and buzzing machines and traffic? Then I highly recommend the Bose QC35. They are also great for air travel and commuting on public transport. You might be surprised what difference the removal of low frequency noise can do for your well-being and the sound quality of your music. How well do the Bose QC35 hold up over time? I have now (as of June 2018) had these headphones for 1 year and 8 months. I listen through them to music nearly every day for 3 to 4 hours. The battery is still holding strong. I use them both in wired and wireless mode with noise cancelling always turned on, and I need to recharge once or at most twice per week. After about a year, I replaced the ear pads because the protein leather was deteriorating, probably due to sweat. The phones get mostly exposed to tropical climate, about 50% of the time without air conditioning. The great thing is that you can buy replacement ear pads. They could be cheaper though, Bose. I use the QC35 a lot while reading and writing in coffee shops and have gotten so used to the noise cancelling that when I switch to my earbuds I almost immediately miss the Bose. I also still do 20-min power naps with the Bose, listening to white noise. The sound quality is as good as it was when I first got them; I would say it is even better. I have listened to a large variety of different material, including instrumental guitar, trance, rock, pop, podcasts, and lectures. The headphones nearly always produce a delightful sound with just about the right the amount of bass and treble. These headphones have become one of my favorite fun gadgets and stress-reduction and cognitive enhancement tools. I hope this review has been useful for you. Have a great day. Inspired by the movie The Unbearable Lightness of Being, based on a novel by Mian Kundera with the same name. Great book! Birgitta Berglund, Peter Hassmen, and Raymond Soames Job, “Sources and Effects of Low-Frequency Noise,” The Journal of the Acoustical Society of America 99, no. 5 (1996): 2985–3002. This entry was posted in Gear and Hardware and tagged noise by Helmut. Bookmark the permalink. Is this good for meditation using brain.fm like app or binaural beats? For Natural beats from their studio, they don’t want any artificial sound added like JBL does for bass to their headphones. Bose uses a volume-optimized equalizer which is on as soon as the headphones are powered on. That being said, I don’t find them overly bassy. I use them for meditation, and they work great for that. For example, Georg Deuter’s music works very well on the QC 35. As to your specific questions: I have never used them for brain.fm or binaural beats. I have experimented with binaural beats in the past and found the concept fascinating, but that’s quite a while ago. 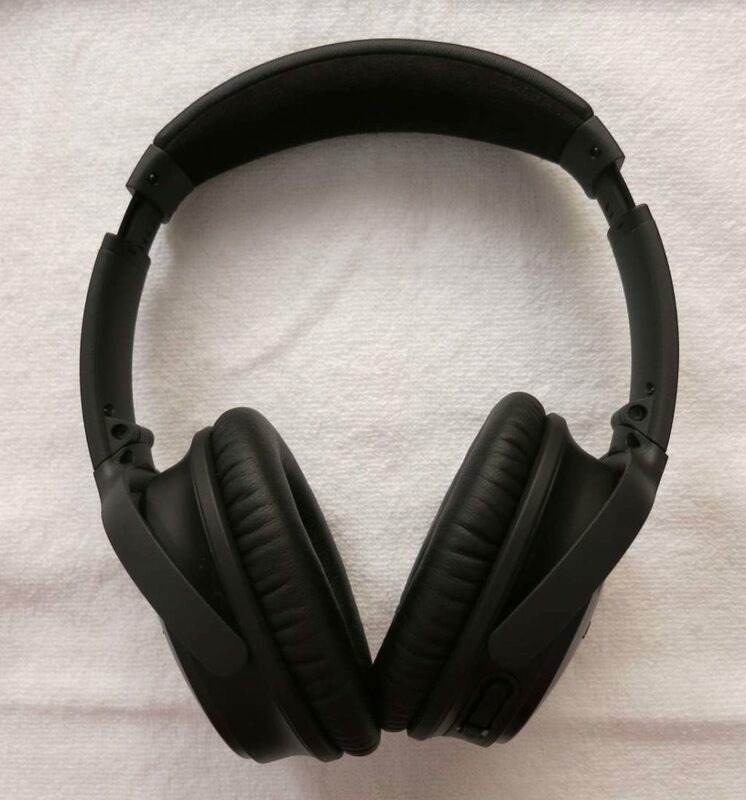 I just did a web search: it seems that other people are using them for that, but I can’t give you an answer based on personal experience QC35 + binaural. You could use the Bose powered-off (in passive mode) with the cable that comes with the headphones. Then you wouldn’t have noise cancelling though. You have inspired me. I have some tracks that incorporate binaural beats and also an app with a binaural beats generator. When I get to it I will give it a try.